In FFXIV A Realm Reborn, materia items which you ‘meld’ into equipment for bonus stats. They come in five tiers of quality. Materia is obtained through converting items that have reached 100% of its ‘spiritbond’. Sounds a bit complicated? Don’t worry – we will guide you from start to end! Unlocking materia for your character to convert and use requires completing two quests. To unlock converting items into Materia, you need to complete the quest “Forging the Spirit”. The only pre-requisite is you need to reach level 19 or greater. To unlock melding Materia onto items, you need to complete the quest which is found right next the first quest giver! The pre-requisite for this one is having a Disciple of Hand class with a level of 19 or greater. EXCEPT CULINARIAN. You do not really have to go out of your way to find this quest (especially if your starting class is not based in Ul’dah), because there is a level 20~ story quest “Life, Materia and Everything” that will lead you to this area anyway. It’s perfectly fine to wait up until this point to unlock these. There really is no rush, especially for the melding part – which has a semi-restrictive pre-requisite especially if you rushed through the starter areas. At lower levels, gear changes constantly so converting/melding isn’t much of an issue until level 50~. What is spiritbond? How do I convert Items to Materia? Almost all equipment has a “Spiritbond” meter. Think of it as the items EXP bar. 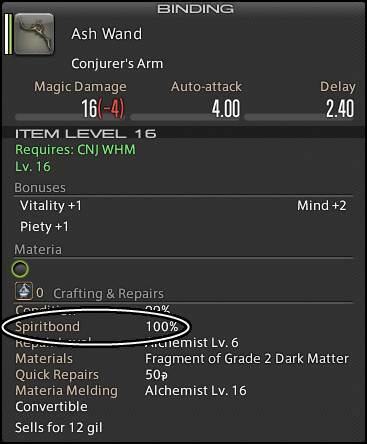 Once spiritbond reaches 100%, the item can be converted to materia if you choose to do so. So far only unique (Green) items cannot be converted into materia (Common, High Quality and Aetherial can). To convert an item to Materia, the easiest way is to simply right-click the item, and select convert. What are the types of Materia? There are currently 24 kinds of materia in the game, each representing a certain stat. There are 5 colors of materia, each corresponds to a grouping of stats. Today I Learned: Guerdon, from the green materia “Gatherer’s Guerdon” means Reward or Recompense (Compensation). Giving the Gathering stat, which is the most basic stat to successfully gather an item – the name is fitting! How do I know what Materia comes from what Item? We are still gaining more insights on how we can better predict this, but here are our current findings. Red Materia is quite like blue materia, but a lot more random. Determination can come from any DoW or DoM gear, Same with Critical Chance. We can assume this trend extends to Accuracy and Parry. You can’t really predict what red materia you will get. We’re trying to find out if the stat that’s found on the item gives weight on the result. Green Materia is pretty simple. Crafting Gear gives crafting materia, Gathering gear gives gathering materia. I don’t think I’ve noticed a break in this trend. Please correct us if we’re wrong, we could have had an extremely skewed sample size. Purple Materia , come in only two types. Quickarm and Quicktongue. Quickarm seems to convert with a low rate from any DoW item (More likely from accessories?). Similarly, Quicktongue comes from DoM items. These seem to have the lowest conversion rate. Grey Materia can come from any DoW or DoM item, with a low chance. We can assume items with inherent resists have a higher chance to drop grey materia. We can also theorize that the resist found on the item can weigh towards the specific resist materia that it will convert into. We will be posting an awesome materia and spiritbond farming guide soon, with some pretty unique findings! Like we mentioned just above, Subscribe so you’ll be the first to know! Materia comes from items, which you can choose to convert if their spiritbond reaches 100%. The base item converted heavily influences the type and quality of the resulting materia. 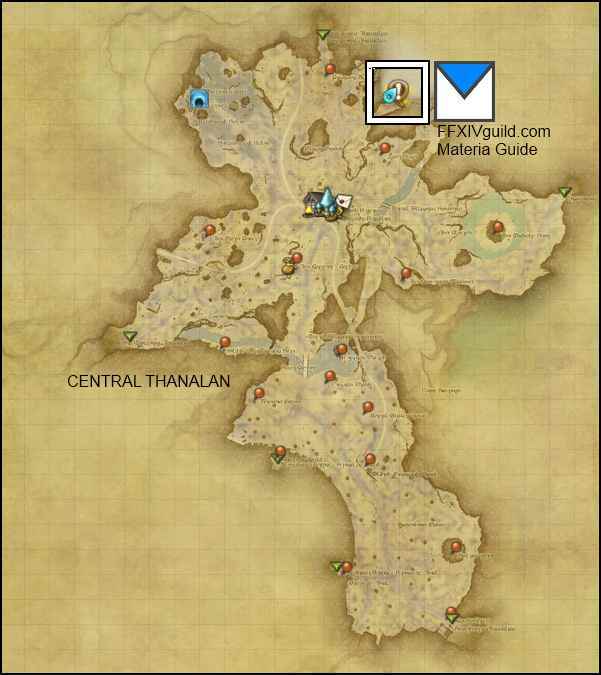 Since you’re checking this guide out, you’re probably around the level of doing dungeons. They’re a surprisingly fast source of EXP (Spiritbond), you can check our Dungeon Guides Directory. Is there a restriction parameter somewhere for the material to actually apply its stat? I seem to recall a material application that resulted in the material entry being in RED, with the stat +0. What is this, and what are the parameters? That is called the CAP of an item. You cannot meld an item with “overflowing stats”. The parameters that determine this is ILEVEL + Stats currently on the item. Generally speaking each item (HQ) comes with a capped MAIN STATS, 1 capped sub stat, and 1 uncapped substat – meaning you can meld ANY substat aside from one of the capped ones (the higher one on your gear currently). Craftsman’s materia is a deep blue colour while primary stat materia is more of a sky blue. The only green materia are the gatherer’s. Aetheryte rings (crafting) gives a random III IV rune. Can be anything really. gotta be 19 for quest now!